Ever wanted to walk among the clouds? Well now’s your chance ­– quite literally! For the next two weeks, Fujiko Nakaya’s Fog Bridge is at Bristol Harbourside, and offers participants the opportunity to walk amongst the fog, suspended over the swirling waters below. It celebrates Bristol’s new status as European Green Capital, as well as the launch of In Between Time Festival. Fujiko Nakaya is a Japanese artist (born in 1933), whose “fog sculptures” represent the culmination of her life long collaborations with nature. The installation on Pero’s Bridge in Bristol highlights the ever-increasing effects of climate change, making the unflinching observation that our world is getting warmer. With fog bridge, an answer is provided. I was reminded of news stories last winter, of Beijing residents watching gigantic televised displays of the sunrise, because the city’s fog had got so bad. 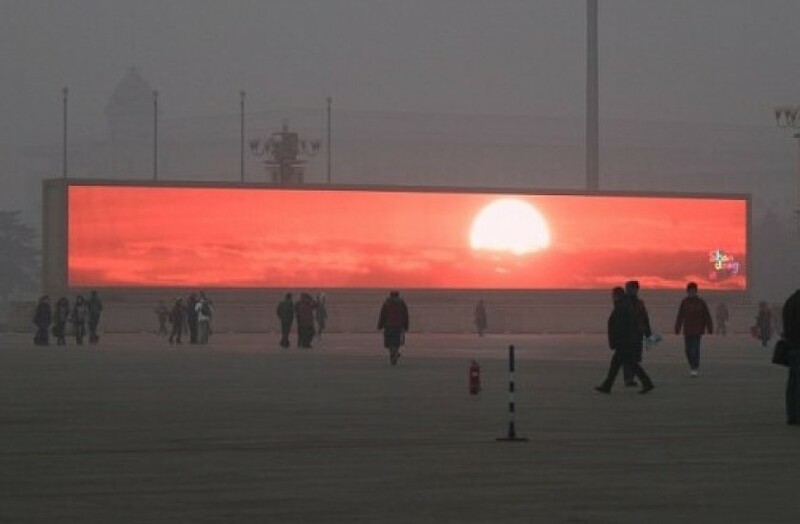 Whilst it eventually came-out that this sunrise was only part of a longer commercial advertisement – the message, and extraordinary images, caught the world’s attention. Nakaya’s work is exactly the opposite in form – but raises the same point. With the introduction of fog and obscurity into the city-centre, will it force people to think, and see more clearly the damage we are all causing to our natural environment? Fog Bridge Bristol is a brilliant example of art getting people involved; talking, laughing, joking, running in and out of the clouds, but most importantly, thinking too. In a way, the ubiquitous epithets describing modern art – “contemporary installations/interventions”, “site-specific occurrences”, “art outside of the gallery” seems to do this work a disservice. For it is so much more than that. It fights against the passive, inaccessible experiences so often associated with these phrases. Fog Bridge is an active and all-encompassing event which makes you look a-new at the world, your immediate surroundings, nature – and your own place within it. The best thing about it, is that you don’t even have to know it’s ‘art’ to be thoroughly engrossed. Nakaya’s art teaches adults (in the same way as her own collaborations with nature), to play with their own environment; to respect it, question it – and most importantly to effect new changes. The theme of this year’s festival is ‘Storm’, and as part of the event, the organisers ask, what do you want to change, what would your personal ‘storm’ be? Nakaya has given her answer. What is yours? Fog Bridge itself runs until 15th February, and its accompanying exhibition runs until 14th March. Entrance is free. Click here for more information. It is part of In Between Time Festival (12th – 22nd February), ran in conjunction with the Arnolfini, Bristol. Last night was their opening evening, and art lovers flocked to the Arnolfini’s galleries for speeches, drinks, art and dance. It marked the start of what promises to be an exciting and engaging festival, and for highlights, events and more – see their programme. I love the idea…but the practicalities seem a bit different. Onle seen it on the TV ..but on a day like today beiong hit by wet mist in a cold wing does not seem like fun!! No doubt there is an artistic story but what about us old codgers haveing to ssssssslowly cross to the other side!!! At what time exactly does it happen? I was trying to check the website but couldn’t find out. Is it at sunset? Hi Lilly – It happens at ‘regular intervals’ throughout the day – between 10am and 8pm, until Sunday 22nd February. Hope you manage to catch it! – Amelia. I liked it. It was better when I thought there was no meaning to it. Just some random idea. ‘Let’s organise it that some fog cascades from the bridge’. Suprise people as they walk over. Yes, I think I agree with you there – a lovely surprise to come across!